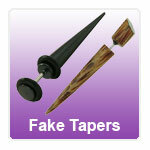 Get the tribal ear stretching look with these range of fake ear tapers. Available in a range of materials including real wood these stretching tapers use your standard ear piercing but give you an authentic look. Wooden, acrylic and steel fake ear stretching tapers and available in straght and curved designs and look super realistic but without the needto stretch your lobes. "Great jewellery, and even better service would definitely recommend jobananas and will definitely buy my body jewellery from here from now on." "Fantastic service, more than pleased with everything I've purchased and always recommend to friends Easy to use website, fantastic delivery options"